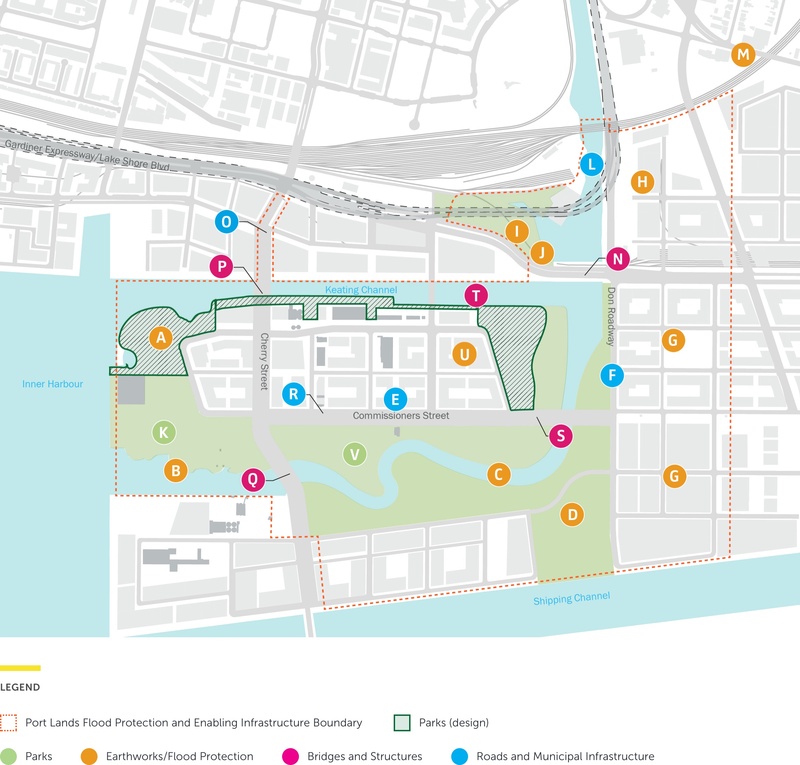 The work we need to do as part of the Port Lands Flood Protection Project can be grouped into four larger categories: parks, roads and municipal infrastructure, bridges and earthworks/flood protection. You can see a breakdown on the map below. In addition to 29 hectares of naturalized area within the new river valley and Don Greenway, the conceptual design identifies 16 hectares of parkland. This parkland includes parkland along the new river, Promontory Parks North and South and Villiers Park, which will be designed to include a variety of spaces, some for activities and some for relaxation. This project includes design for the entire park and construction of the southern portion of the park. In total, we’ll build 11 hectares of parkland. Take a look at the transformation in store for the Port Lands. As part of this project, we’ll build the southern portion of the park and design the northern portion. We’re building parkland on the north and south sides of the new river. Lakefilling around Essroc Quay will support the realignment of Cherry Street and create the foundation for Promontory Park. We will also create coves along the new shoreline where fish can find food and shelter and small boats can launch. The north side of Polson Slip will become part of the naturalized river valley. The wall of the slip will be reinforced so that it can withstand fast-flowing waters during a major storm. We’ll create a new one kilometre river valley as a new outlet through which the Don River can flow. The banks of this river valley will be reinforced to withstand fast-flowing waters during a major storm. A naturalized river mouth will be part of a renewed ecological system of coastal wetlands and meadows. In total, we’ll create 40 hectares of lush greenspace and parkland as part of this project, including these wetlands. In total, we’ll create 40 hectares of lush greenspace and parkland as part of this project. That includes the wetlands and marshes in the Don Greenway. The Don Greenway will be a new secondary outlet for the Don River. During very large floods, water from the Don River will flow through the Don Greenway into the existing Ship Channel. In normal conditions, the wetlands in the Don Greenway will be sustained by water from the Ship Channel. This raised area will be built south of Lake Shore Boulevard along the existing Don Roadway. It will eliminate the risk of flooding to the area of the Port Lands east of the Don Roadway. This flood protection landform will be built on the east bank of the Don River between the Metrolinx Rail Bridge over the Don Valley Parkway and Lake Shore Boulevard. It will eliminate the risk of flooding to the future East Harbour development site, east of the Don River. Sediment and debris need to be removed regularly from the Don River to keep water flowing safely through the river valley, reduce the impact of flooding and maintain safe navigation in the inner harbour. Currently, Ports Toronto dredges mud, silt and larger debris from the Keating Channel. To allow water to flow under the Lake Shore Bridge during a major flood, we need to widen and deepen the Don River upstream of this bridge. This will slow down the water, releasing more sand and silt onto the river bed. To address this, we are moving dredging operations and debris management north of Lake Shore. We will install a series of weirs (fences or enclosures) near the Lake Shore Bridge that will allow us to control the amount of water that enters the new river valley and the Keating Channel. This will help avoid flooding and ensure that there’s always enough water flowing through the new river valley to support a healthy ecological system. We will raise the grade of the land surrounding the Eastern Avenue underpass of the CN Rail line to help protect against flooding during major storms. To flood protect the Port Lands, the majority of land within the Don River’s floodplain will be raised by a minimum of one to three metres. As part of this project, we’ll design grading for all site in the area, including Villiers Island. As development progresses in the Port Lands, it will be the future developers’ responsibility to re-grade their individual sites. The existing bridge at Lake Shore Boulevard and Don Roadway and the adjacent rail bridge act as a pinch point. This restricts the flow of water, increasing flood risks. By extending the Lake Shore Bridge at its west end by three spans, we will create a wider opening over the Keating Channel. This will allow higher, faster water to flow safely through the channel during major storms. Additional opportunities to coordinate with the Gardiner East Project may offer more significant modifications to this structure. This new bridge will include a dedicated transit lane which will be used for Bus Rapid Transit (BRT) until it can be replaced by Light Rail Transit (LRT). Once the new bridge is in service, the existing bridge with be demolished. We will design this bridge to accommodate the higher, faster waters expected to flow beneath it during a major storm. Currently, the only outlet for the Don River to Lake Ontario is through the Keating Channel. We will keep the Keating Channel and create two new outlets for the river – the naturalized river valley and the Don Greenway. Most of time, the water you’ll see in the Keating Channel as you stroll along the new urban promenade will be lake water. Weirs located upstream of the Keating Channel will divert water from the Don River into the new naturalized river valley. During large floods, more water will be diverted into the Keating Channel to avoid overwhelming the natural system. We’ll make some modifications to the Keating Channel, including reinforced concrete walls and improved habitat features for fish and other wildlife. We will create new systems and extend existing systems. This includes utilities like hydro, lighting, gas and telecommunications. A new water distribution network will connect future communities to the existing municipal water mains. A new municipal sanitary sewer network and pumping station will carry wastewater from future communities to the Ashbridges Bay treatment facility. And a new stormwater system will manage rainwater during major storms. We will rebuild the Don Roadway between Commissioners Street and Lake Shore Boulevard at a higher elevation to protect the lands east of the road from flooding during a major storm. The new road will include two vehicular travel lanes and sidewalks on each side. We will work with Hydro One to adjust portions of its existing transmission line located in or near Commissioners Street East, the Don Roadway North and the Don Roadway Valley wall feature. A Hydro One utility bridge that currently crosses the Lower Don River north of the rail bridge, also hinders the flow of floodwaters and will need to be modified in order to deliver flood protection. We will coordinate with Hydro One to make sure our roads and flood protection features are designed to accommodate its infrastructure. The new Cherry Street will include sidewalks, on-street bike lanes, a dedicated transit lane and two lanes of vehicular traffic. It will be built approximately 50 metres west of the existing Cherry Street to preserve the heritage structures located on either side of the existing street. Once the new street is in service, the existing street with be demolished. Commissioners Street will be maintained in its current alignment but widened to accommodate dedicated transit and cycling lanes. Dedicated transit lanes will be used for Bus Rapid Transit (BRT) until it can be replaced by Light Rail Transit (LRT). We will build a pedestrian pathway along the southern side of the street, which borders the northern edge of River Park.